MicroFEM for Windows is a Finite-Element Program for Multiple-Aquifer Steady-State & Transient Ground-Water Flow Modeling. The Windows version of MicroFEM takes you through the whole process of ground-water modeling, from the generation of a finite-element grid through the stages of preprocessing, calculation, postprocessing, graphical interpretation and plotting. Confined, semi-confined, phreatic, stratified and leaky multi-aquifer systems can be simulated with a maximum of 20 aquifers. Irregular grids, as typically used by finite-element programs, have several advantages compared to the more or less regular grids used by finite-difference codes. A model with a well-designed irregular grid will show more accurate results with fewer nodes, so less computer memory is required while calculations are faster. MicroFEM offers extensive possibilities as to the ease of creating such irregular grids. Two grid generators are included; one is designed for irregular geometries as often encountered in regional studies, while the other is useful for engineering applications that often require high contrasts in node spacing, e.g. sheet piling and excavations. Adding and erasing nodes, connection swapping and further modifications to the grid can be done interactively. Other MicroFEM features include the ease of data preparation and the presentation and analysis of modeling results. A flexible way of zone-selection and formula-assignment is used for all parameters: transmissivities, aquitard resistances, well discharges and boundary conditions for each layer. Depending on the type of model this can be extended with layer thicknesses, storativities, spatially varying anisotropy, topsystem and user-defined parameters. 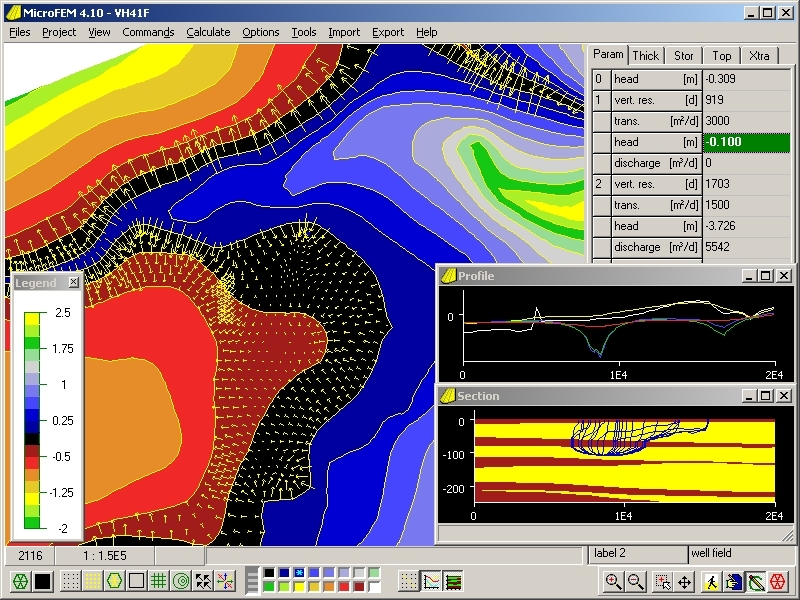 To inspect and interpret model results, maps and profiles can be used to visualize contours, heads, 3D-flowlines, flow vectors, etc. Time-drawdown curves and water balances can be selected with just a few keystrokes or mouse clicks. MicroFEM has a built-in 3D-model viewer as well as a built-in optimization tool to calibrate steady state models based on the Levenberg-Marquardt algorithm. Up to 40 parameters (hydraulic properties and boundary conditions) can be estimated on the basis of up to 2000 observations. Download and try the free MicroFEM-LT version. Details can be found in the Users guide (25 pages), the MicroFEM course for starters (57 pages) and the MicroFEM tutorial (57 pages) that can all be downloaded from this web site as pdf-files. Excellent customer e-mail support is an essential part of a MicroFEM license, and an integral part of its development. Many of the MicroFEM enhancements are the result of customer suggestions. MicroFEM is updated several times per year. Recent modifications are described in the update.txt file. Free updates of any full version of MicroFEM can be downloaded anytime by means of the Customer login system. Its capacity, flexibility and ease of use have made MicroFEM the most widely used groundwater modeling program in the Netherlands. Currently there are over 350 companies, universities, and government agencies using our software in more than 30 countries worldwide.